Check out our favourite things to do around the Gannawarra Shire! Celebrate Australia Day with friends by entering the Koondrook Barham Lilo Race on the Murray River. Grab your mates, pack a BBQ and go waterskiing at Lake Charm, Kangaroo Lake or Cohuna Ski Run. Hire a canoe or stand up paddle board from Cohuna Adventures. They will even drop off and pick up canoes for you! We recommend checking out the Canoe Trail in Koondrook. Submit your artwork or sign up for a workshop at the Youth Arts Festival held in Kerang during December. (All year ’round) Attend special men and women’s nights hosted at the Kerang Baptist Church. They are a great way to connect and talk about God, discuss personal issues and meet some lovely people. Contact the church for more information. Visit Dr. Graham’s Hut, the last remaining hut on the Murray River located in the Gunbower State forest on McClure’s Bend. Enter the Cohuna Bridge 2 Bridge on the first weekend of March. You can run, bike ride, swim or canoe. Try a Chicken Parma from the local pubs and cafes. Take a trip to Boort and visit the amazing Spanner Man. Displayed in the country garden are over 25 unique life size and larger than life sculptures made out of spanners. Take a trip through the Shire and head to Mount Hope to climb Suicide Rock. On the way home stop by Lions Park at Kow Swamp and enjoy a BBQ with friends. The old water tower on the highway near the Sir John Gorton Library is open to the public. Climb up the internal stairs and look out to 360 degree views of the Kerang Township. Join your local Football Netball Club! Over Queens Birthday long weekend grab your mates or family and go camping in the Gunbower State Forest. 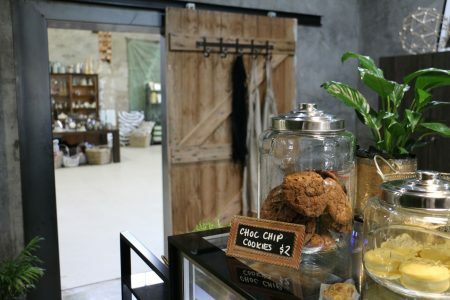 Enjoy a hot chocolate at Factory & Field, a unique coffee house and gift shop set within the old Cohuna butter factory. Walk/ride around the ‘Back Swamp’ in Kerang which is part track and part levee bank next to the river. It has beautiful native fauna and flora. Take a ride on The Wetlander (a fully catered and air-conditioned, twin hulled tourist boat) on Gunbower Creek near Koondrook, or get a group of friends together and book the Egret via Cohuna Nature Cruises which has onboard BBQ facilities. Enter the Cohuna parkrun for free! Workout at an outdoor gym in the Cohuna Apex Park, Kerang Atkinson Park or Koondrook Apex Park. Submit your favourite things to do around the Gannawarra Shire here!